Robert D. Hormats is Vice Chairman of Goldman Sachs (International). He joined Goldman Sachs in 1982 and was named Managing Director in 1998. Mr. Hormats served as Assistant Secretary of State for Economic and Business Affairs from 1981to 1982, Ambassador and Deputy US Trade Representative from 1979 to 1981, and Senior Deputy Assistant Secretary for Economic and Business Affairs at the Department of State from 1977 to 1979. He served as a senior staff member for International Economic Affairs on the National Security Council from 1969 to 1977, where he was senior economic advisor to Dr. Henry Kissinger, General Brent Scowcroft and Dr. Zbigniew Brzezinski. Mr. Hormats was a recipient of the French Legion of Honor in 1982 and the Arthur Fleming Award in 1974. Mr. Hormats has been a visiting lecturer at Princeton University and currently is a member of the Board of Visitors of the Fletcher School of Law and Diplomacy. 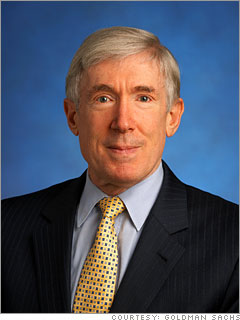 Mr. Hormats is also a member of the Council on Foreign Relations and a board member of the Economic Club of New York. Mr. Hormats’ publications include The Price of Liberty: Paying for America's Wars from the Revolution to the War on Terror; Abraham Lincoln and the Global Economy; American Albatross: The Foreign Debt Dilemma; and Reforming the International Monetary System. Other publications include articles in Foreign Affairs, Foreign Policy, The New York Times, The Washington Post, The Wall Street Journal, American Banker and The Financial Times. Mr. Hormats earned a B.A. with a concentration in Economics and Political Science from Tufts University in 1965. He earned an M.A. in 1966 and a Ph.D. in International Economics in 1970 from the Fletcher School of Law and Diplomacy. Bureau of Economic and Business Affairs State Department division that promotes economic security and prosperity at home and abroad.